Located directly between Peak 8 and Peak 9, this ski-in, ski-out condominium is one of the newest developments in Breckenridge! The lobby entrance is welcoming with luxurious décor and complimentary refreshments for owners and visitors. Condominium accommodations range from 1-bedroom units with a den, to 4-bedroom units with a den. Take a seat on your private patio after a long day on the slopes and enjoy beautiful mountains views amongst peaceful woodland silence. When it comes to accommodations, BlueSky Breckenridge has it all! Head down to the first floor and let Charter Sports take care of all of your rental needs. Store the rentals across the hallway in the ski storage locker room, and grab your equipment with ease before walking out the back door to the Snowflake Lift! After successfully maneuvering around Breckenridge Ski Resort, soak in one of the three tranquil hot tubs and swim a few laps in the outdoor heated pool. The in-house, full service spa is a great place to relax with a range of massage services, skincare services, manicures and pedicures. While relaxing, the kids will be more than excited to spend a few hours in the arcade located right next to the fitness room! Just a few blocks up Four O’Clock Road from downtown Main Street, easily walk into town for dinner or contact the front desk to catch the complimentary Mercedes Sprinter Shuttle! Ride in comfort to desired Breckenridge locations and call the front desk when you are ready to be picked up! With only 52 units on property, staff attention is extremely quick and attentive! 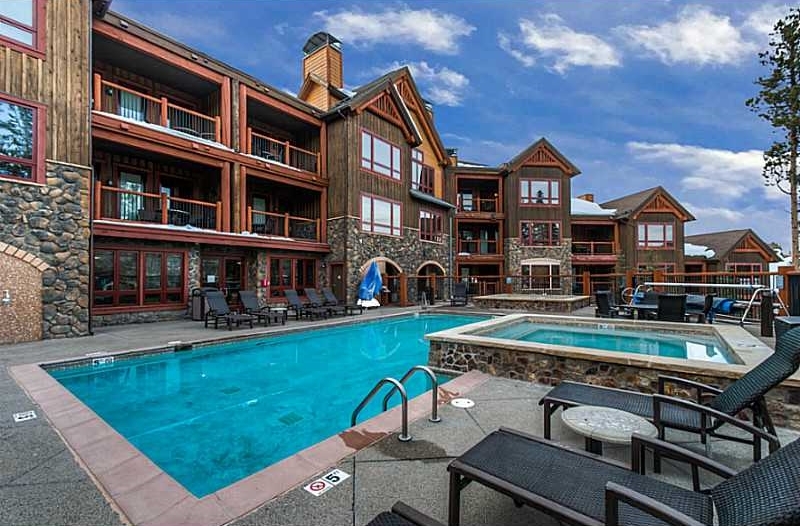 As a condominium owner at BlueSky Breckenridge, you have access to everything the town of Breckenridge has to offer at your fingertips! World-class dining and cuisine, pubs, shops and boutiques line the historical main street of Breckenridge. Relax at the many spas located throughout town or grab a drink at the many après ski stops. Enjoy theatrical productions located at the Backstage Theatre in the Breckenridge Arts District or a concert at the Riverwalk Center. Some of the most popular winter activities in the area including but not limited to; world-class skiing and snowboarding, Nordic skiing, snowshoeing, dog sledding, snowmobiling and ice skating. In the summer months you find amazing hiking trails ranging from easy, beginner hiking to more extreme hiking up to the tops of 14ners. Mountain biking is just as popular – Breckenridge has some of the best trails in the state! If road biking is more your thing, jump on the paved bike path that goes for miles all around Summit County while you enjoy spectacular mountain views! On a hot day, cast a line in the rushing Blue River that flows through the center of town or hop on a SUP board and give it your best while paddle boarding on the Maggie. Make BlueSky Breckenridge your mountain residence today! If you would like more information about this spectacular subdivision, the professional team of brokers at Real Estate of the Summit will be more than happy to assist you with all your Summit County real estate needs. Call our office at 970-453-1450 or fill out the contact form below and we will get in touch with you.